Hark the Sound for Tar Heel asses, being not as fat! Gumby's has closed! Check out an article on the closing here. I seriously wish this had happened when I was in college. Not because I want anyone to go out of business. Just because it would probably have saved me about 20 of my freshman 30. That's pounds, btw. Not number of times I was asked out. 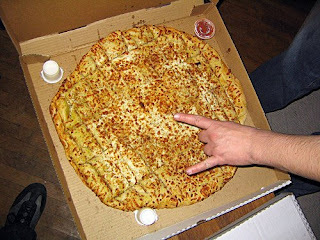 They don't call that XXL Pokey Sticks a DAMNIT for nothing. If you're desperate for a replacement <s>in this time of need</s> the next time you are drunk or hungover, try the Cheese Sticks from Papa John's. They as good as, if not better than Pokey Sticks. AND they come with a garlic butter sauce. I love it when things automatically come with fatty sides or sauces. Then you can be like, "Oh, I didn't even order this!" But you can still eat it because it's there. College will never be the same. Rogue Vintage - Giveaway Day!